This WVG3047SGB washer dryer combo from Bosch is the perfect fit for any growing family. With a stylish silver finish and many useful features that help keep the costs down, it cares not only for your clothes, but also the environment. It is no surprise that the Bosch WVG3047SGB has been awarded an A-class rating for energy efficiency. This means that during a cycle, it works to be as kind to the environment as possible whilst keeping your bills down to an all time low. 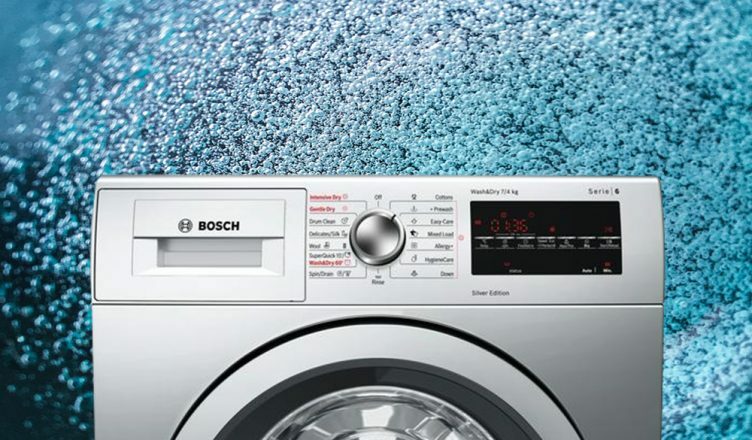 Designed to take expert care of your clothes, the Bosch WVG3047SGB offers a generous amount of wash programmes. Allowing you to choose from specialised programmes, such as SpeedPerfect or EcoPerfect, and helping you tailor the wash to suit your needs. The programmes previously mentioned are particularly helpful when you are in a hurry, with the respective functions saving 30% on energy or cleaning everything 60% faster. This machine also benefits from a fast maximum spin of 1500rpm, allowing the clothes to spin quicker and thus reducing the total drying time. With an abundance of helpful features, you’re able to seamlessly tailor your wash experience to your own laundry. If you have sensitive skin, you’ll love the Allergy+ programme, as it uses a more intense cycle to remove allergens from your clothes. The Bosch WVG3047SGB even has an EcoSilence Drive, which uses fewer moving parts to make this washer dryer efficient and quiet. 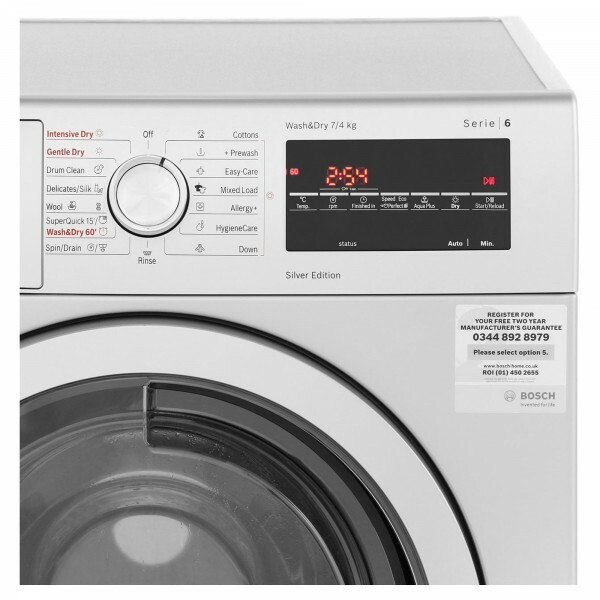 It also makes the Bosch WVG3047SGB one of the quieter machines you can buy, being just 47db on wash and 56db on dry, this means that there is no disturbance whilst watching TV in the evening. It is even quiet enough to start a wash cycle going while you are in bed! It is also worth noting that while the EcoSilence Drive is very reliable, Bosch has provided a 10-year warranty for this part of the machine. This machine comes with a 7kg wash load and a 4kg drying load, allowing you to wash up to 40 shirts or eight large towels with ease. 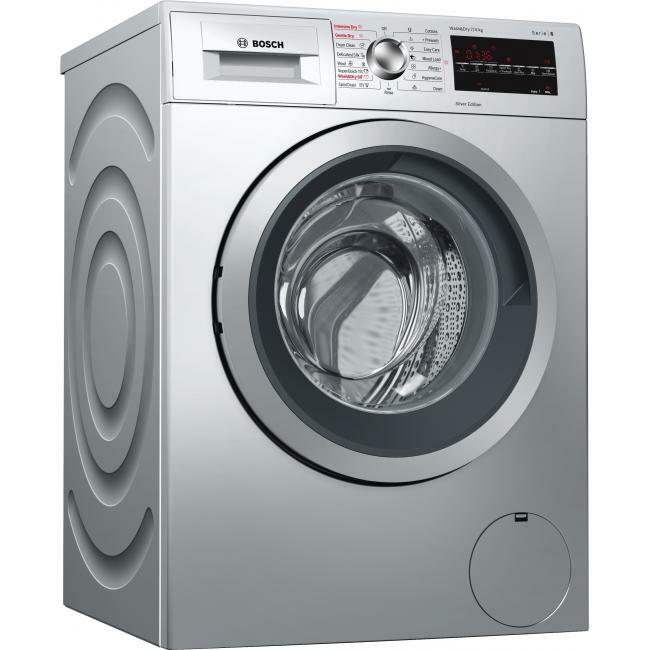 Other features of this stylish machine include the following: a flow-through sensor for optimum water use, an extra large drum with a SoftSurge system to protect the life of your clothes and a safeguard monitoring system, which adjusts the load distribution and programme settings to provide premium protection for your garments. To conclude, the Bosch WVG3047SGB represents a great buy for a growing family. With an abundance of programmes and added features to make your life easier, this washer dryer keeps functionality and energy saving at the forefront of its design. For more information, visit your nearest Hughes store or check out our product page online. If you are in a hurry, buy your new washer dryer on our website and use our click and collect service for a pick up slot as little as one hour after purchase from a nearby Hughes branch.